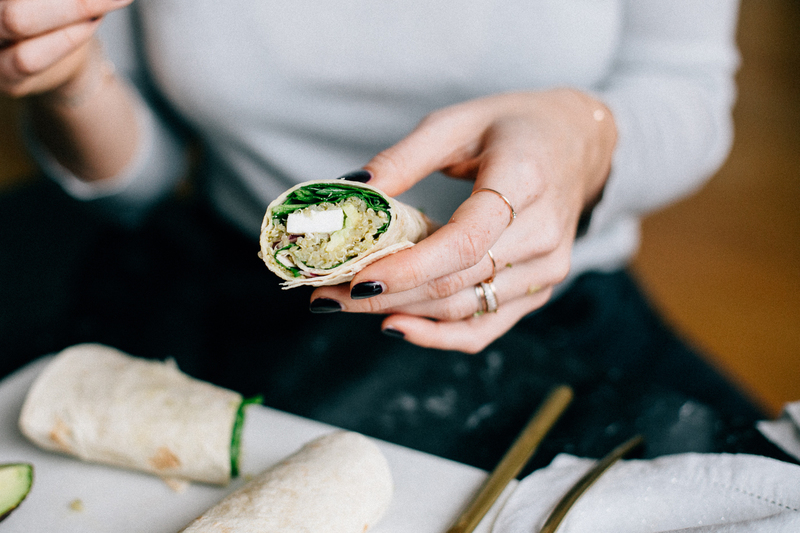 The other day, I picked up a healthy lunch wrap with quinoa, pesto, spinach and feta on the go. It ended up being SO good that I tried my best to figure out exactly what it was composed of to recreate a similar wrap at home. 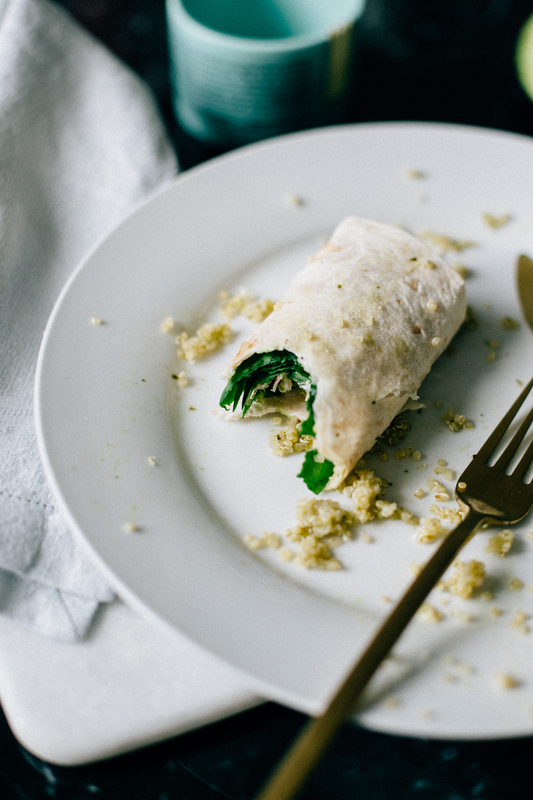 This past weekend, I made the green quinoa wraps for Mike and I, and even he was impressed. Reason enough to share the recipe with you guys just in time for lunch, right? Start by cooking the quinoa according to the directions on the package. Once the quinoa is fully cooked, rinse it with cold water to drain the bitters and cool it down. Then season it with salt, pepper and the pesto. 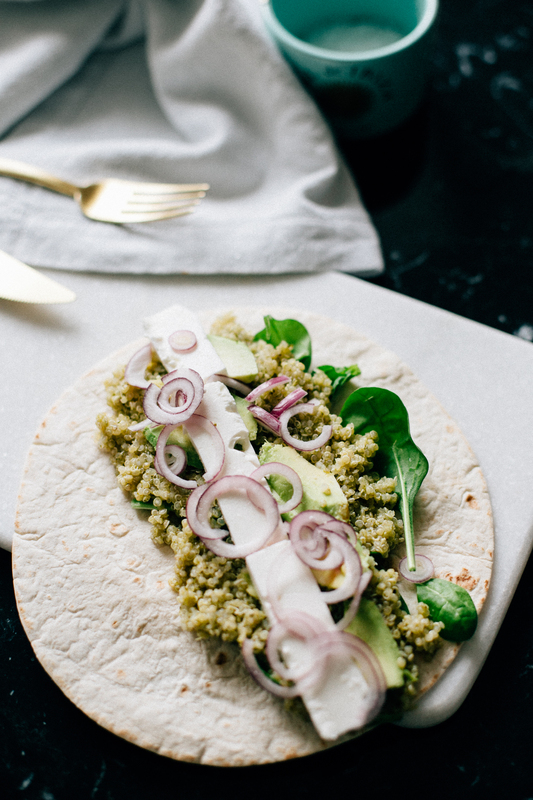 On the tortilla, spread out some fresh baby spinach, top with the pesto quinoa, sliced avocado, feta and some thinly sliced red onion. If you have other fresh herbs at home, feel free to add those as well. The wrap I originally had also had a few goji berries sprinkled on top – but unfortunately I was all out. Wrap things up and cut in half. Easy as that! Bowl love: If you’d rather skip the tortilla wrap, just toss all of the ingredients together in a bowl for a gluten-free alternative. Want more healthy lunch inspo? How about creamy avocado pasta? Find the recipe here. 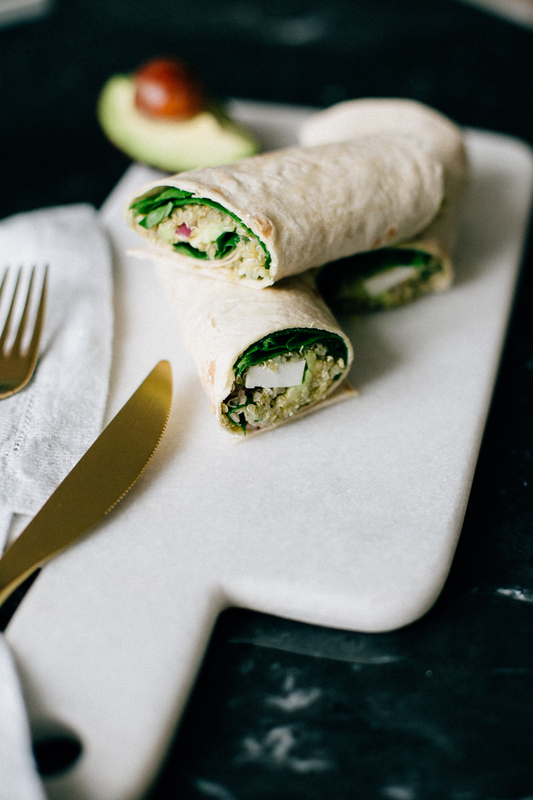 These wraps look super yummy. 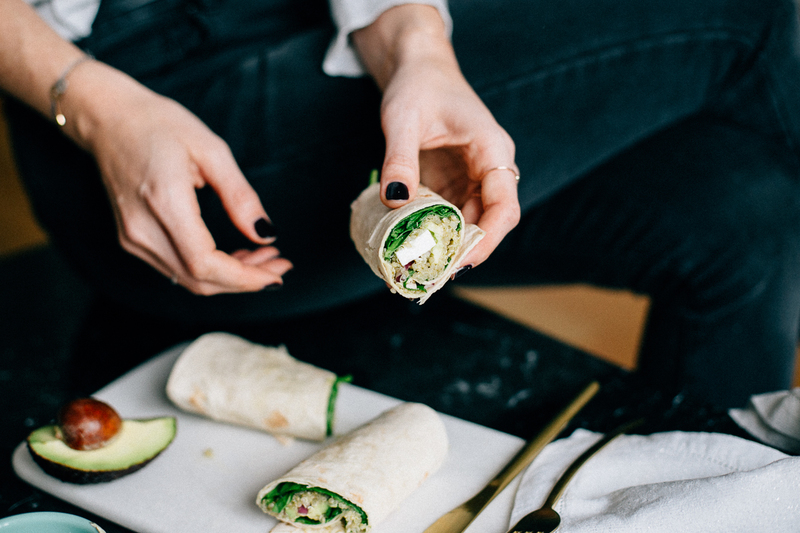 If I am up for a quick and healthy lunch I always go for wraps and there also easy to prepare at home and bring to work in a brown bag. Definitely will try out the recipe! 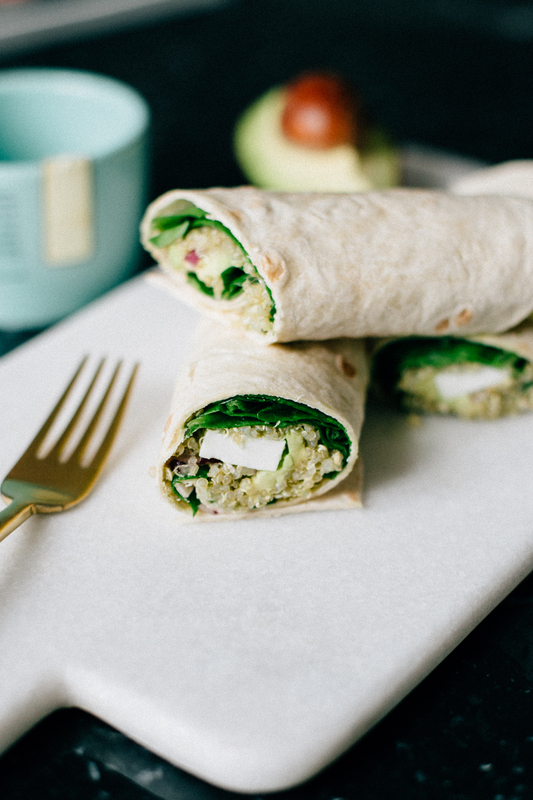 Hhhm, die Wraps schauen super lecker aus und da sie Quinoa und Avocado beinhalten können sie nur meeeeega lecker sein!!! Die muss ich unbedingt ganz bald nachmachen! im Netz gibt es eine schier unendliche Vielfalt an Rezeptideen. Doch nur bei deinen (und denen auf dailydose) bleibe ich immer wieder hängen und habe bisher noch von keinem anderen Blog mehr Rezepte nachgekocht. Ihr habt ein sensationelles Händchen dafür, wenn es um leckere, gesunde und unkomplizierte Rezepte geht. Das heutige Gericht reiht sich da ein und auch dieses werde ich wieder nachkochen. danke dir für das super liebe Kompliment – freut mich riesig! Manchmal denke ich mir, ob die Rezepte die ich mit euch teile nicht vielleicht zu unspektakulär sind… umso mehr freue ich mich daher wenn sie dir gefallen und auch wirklich nachgekocht werden! Tolles Rezept und herrliche Bilder dazu – das muss ich probieren!!! Hmmm this looks and sounds very delicious!